There is beauty in simplicity. Turns out, there is also happiness. I’m all for making life more manageable and easy. The name of this blog, after all, is “Simply” Stacie. My focus is on helping you, my readers, to make life less complicated through easy recipes, tips and tricks and advice on what has worked for me. If you are looking for ways to simplify your life and reduce stress, read on. We’re talking about seven things you can start doing today to make life less complicated! But first, let’s look at the proof that simple is better. I already know this and now it’s been proven in a recent study by Schick Intuition. 750 moms across Canada were surveyed and the results were telling. It showed that the happiest moms were the ones who took active steps to simplify their lives. They coined the term, voluntary simplicity, a philosophy of living simply and reducing stress. It makes complete sense. Being stressed out and having too much on my plate makes me unhappy. 92% of moms agree and say that simplifying aspects of their life would make them happier. So where do you even begin to make life more manageable? Let’s take a look at some tips you can start implementing NOW to take back your happiness. 1. Clear your clutter. It’s true that clutter can hold you back. Having stuff everywhere and in a disorganized state means you spend too much time looking for the items you actually use. If you don’t need it, use it or love it, lose it. It’s really simple. Start a Donation Box and place items that you want to purge inside. When the box is full, donate it to a local charity that accepts used goods. You won’t miss the “extra stuff” and you’ll have room to enjoy the items you love. 2. Use a calendar system. Don’t rely on your memory to remember appointments and important dates. It’s a recipe for disaster. I’d be lost without my personal calendar and to-do list. I use an app called Awesome Calendar to ensure I don’t miss appointments. For my to-do list, I love the app, Trello. It makes prioritizing what I need to do on that particular day a breeze. I’d be lost without them! If apps aren’t your thing, try the old-fashioned way of pen and paper. The main thing is to find a system that works for you. 3. Manage email before it manages you. Emails can easily become out of control and overwhelming. I had one email account with over 10,000 emails in it. It was horrific and I felt my anxiety creep up every time I opened it. I spent about a week going through to file and delete emails and I finally got it down to 0. Instant relief! Now when I open my email, I take action instantly by either unsubscribing, deleting or responding. I will not let it get like that again. 4. Order dinner in every once in a while. Don’t feel like you have to prepare a gourmet, home cooked meal for your family every single night. It’s totally fine to order a pizza or hit the fast food drive thru on the nights you need a break. If it’s out of your budget, opt for preparing simple meals. I keep frozen food in my freezer for the nights I don’t feel like cooking. Pop a pizza or a sheet of fries and nuggets in the oven and everyone is fed and happy. There’s no harm in that. 5. Focus on cleaning what matters. Your home does not have to be showroom perfect at all times. I spend about 15 to 30 minutes a day doing what I call a “quick clean” where I tidy up the high traffic areas of my home. I give the carpet a quick vacuum and sweep up the kitchen floors. Dirty dishes go in the dishwasher and I clear off the counters. I also like to make the beds every day because I love the feeling of slipping into a neat, tidy bed at night. 6. Learn to say “no”. This tip changed my life. I’m naturally a people pleaser and always felt guilty telling someone “no”. I started being resentful and grumpy when I realized that I didn’t want to do whatever the person asked of me. I was sacrificing my own happiness. I made the conscience decision to stop this behaviour. Now I follow this mantra: “If it’s not a heck yeah, it’s a NO.” Simple, right? It’s made a world of difference on my stress levels and also freed up time to enjoy the things and people in life that I love. 7. Simplify your beauty routine with time-saving products. When you look good, you feel good and I’m not saying to give that up. Instead, search out products that combine a few steps into one so you aren’t spending any more time than you need to primping and pampering. 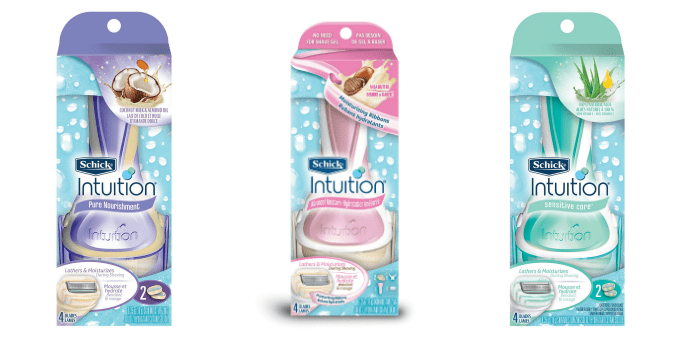 I love Schick Intuition razors with their three-in-one benefits. They prep the area with a silky lather, give you a close and clean shave and moisturize leaving skin feeling soft and smooth. You don’t need to use shave gel or extra moisturizer. It’s the perfect razor for a busy woman on the go! Happiness is simple. By being intentional with your day-to-day living and choosing to do things that make life less complicated, you will be much more at ease and a happier person. The Schick Intuition Simplicity Curve shows a direct correlation between happiness and simplicity. Check it out below! Do you have any other suggestions for simplifying your life for happiness? I’d love to hear about what works for you. lots of great tips! I don’t have anything to add…. I am lying in bed (under the blankets) reading this article and feel so empowered and organized now! I am waiting (somewhat patiently) for Trello to finish downloading, and cannot wait to put all your helpful tips into action! Coincidentally the last two days I have been purging my closet and drawers.. thank you for reaffirming my purpose! Hope you have a most wonderful weekend!! These are great tips, thanks! Right now, I’m working on my clutter!! Only thing I would add is don’t put up until tomorrow what you can do today. things get put off too long they seem unmanageable.